Description: Powwows are large social gatherings of Native Americans who follow traditional dances started centuries ago by their ancestors, and which continually evolve to include contemporary aspects. These events of drum music, dancing, singing, artistry and food, are attended by Natives and non-Natives, all of whom join in the dancing and take advantage of the opportunity to see old friends and teach the traditional ways to a younger generation. 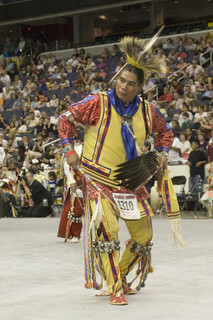 During the National Powwow, the audience see dancers in full regalia compete in several dance categories, including Men and Women's Golden Age (ages 50 and older); Men's Fancy Dance, Grass and Traditional (Northern and Southern); Women's Jingle Dress, Fancy Shawl, and Traditional (Northern and Southern); Teens (13-17); Juniors (6-12) and Tiny Tots (ages 5 and younger). The drum groups are the heart of all powwows and provide the pulsating and thunderous beats that accompany a dancer's every movement. The powwow is led by three "host drums" that showcase three distinct styles of singing (Northern, Southern and contemporary) and represent the best examples of each style. The drum contest highlights groups of 10 to 12 members each, and they sing traditional family songs that are passed down orally from one generation to the next. 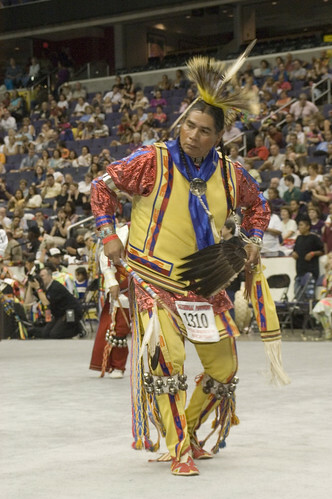 The National Museum of the American Indian sponsored the National Powwow in 2002, 2005, and 2007 as a way of presenting to the public the diversity and social traditions of contemporary Native cultures.